First Time in Bali – Where Should I Stay? Which Part of Bali is Best for Me? First Time in Bali: Where Should I Stay? Where Should I Book My Hotel in Bali? On planning your first trip to Bali, your first critical challenge is choosing where to stay and which beach is best for you. Making the wrong choice could ruin your holiday. Even though Bali is a small island, its different beaches and areas offer their own set of features. What one lacks in dynamic nightlife it might make up for in quiet and laidback settings, and so forth. It's worth going through some of the highs and lows of each of Bali's most popular areas before deciding which hotel to book. If you're planning your first visit to Bali, or just curious about which hotel, location and highlights is the best fit for you, here's a quick guide showing you the main features of Bali's most popular areas. Should I book my hotel in Seminyak? Best known for its beautiful and fairly quiet sunset beaches, Seminyak is Bali’s upmarket beach resort area, where luxury five-star resorts, secluded villas, world-class beach clubs and hip sunset venues line the coastline and main streets. Most of the island’s best restaurants are found in this area, and most happen to be on a single popular dining street known as Jalan Laksmana or Kayu Aya. Another street, Jalan Dhyana Pura or Camplung Tanduk, is known as the gay-friendliest, with fun bars set virtually side-by-side. It’s also a shopping paradise with many designer boutiques and brand shops around. You like Seminyak? Now pick the right hotel! Should I book my hotel in Ubud? The main destination in Bali’s central highlands, Ubud is a small town that offers an alternative to the tropical beach scene. More cultured and closer to the island’s classical artists’ villages, the area also features verdant river valleys and rice terraced landscapes. A collection of five-star retreats make the most of this, some offering magnificent spas and wellness programs to suit. World-class and fine dining restaurants are adjacent casual cafes; royal palaces, heritage museums and art galleries are nearby fashion boutiques, yet the nightlife scene is mainly low-key. You like Ubud? Now pick the right hotel! Should I book my hotel in Kuta? Bali’s most famous beach; Kuta was once a fishing village that turned into a surfing mecca. Today, in addition to the great surf, it is also one of the island’s major nightlife areas, and offers something for all visitors. A favorite for budget travelers, there’s countless restaurants, bars, a big mall, the largest waterpark in Southeast Asia, and a wide variety of hotels to suit any budget. Being close to the airport, only 10 minutes’ drive north, adds to the convenience. You like Kuta Beach? Now pick the right hotel! Should I book my hotel in Legian Beach? Sandwiched right between Seminyak and Kuta, Legian offers a mix of these two famous beach resort areas. Cheap beachfront hotels present quiet spaces to relax, while out on the main streets are among Bali’s most famous bars and venues which draw young travelers and partygoers. It comprises an eclectic mix of restaurants and bars. There are fewer crowds in some parts of Legian Beach compared to Kuta, and its close proximity makes a great choice for those wanting to experience both areas. Maze-like streets with dominantly one-way traffic make navigating a bit of a hassle. You like Legian Beach? Now pick the right hotel! Should I book my hotel in Jimbaran? Jimbaran Bay is one of the most beautiful places to be for sunsets in Bali. Most of the hotels here are international chains and five-star resorts. Dining options follow suit, with great fine restaurants within. One of the main local seafood dining destinations here is the famous cluster of seafood cafes and restaurants on Muaya Beach, simply known as ‘Jimbaran Seafood Cafes’. Shopping and nightlife remain low-key, while some resorts, especially those on the rocky limestone cliff south of Jimbaran, feature spectacular sunset cocktail venues. You like Jimbaran? Now pick the right hotel! Should I book my hotel in Nusa Dua? Bali’s most exclusive beachfront resort enclave; virtually all hotels in Nusa Dua are international five-star resorts. These line the gorgeous white sand southeastern coast, which is very well-maintained by ITDC, a state-owned corporation. The same goes for the meticulously landscaped flower and water gardens and paved walking paths just outside the resorts. A 24-hour tourist police force patrols the environs. Quality dining options are within respective hotels; nightlife is mostly contained within hotels and are mostly of the refined bar scene, while shopping is focused at the central grand complex known as the Bali Collection. You like Nusa Dua? Now pick the right hotel! Should I book my hotel in Sanur? As Bali’s first tourism resort area, Sanur is famous for being mostly slow-paced and laidback. This quiet sunrise beach offers a relaxing coastal atmosphere, much the antithesis of the youthful and livelier Kuta and Legian on the other side of the island. Here you will find some of Bali’s legendary hotels, perfect for honeymooners and elders looking for a classical Bali setting, and those looking for a place where they can take things slow, hence the longer stays. A multitude of restaurants line the main streets of Jalan Danau Tamblingan, as do a myriad of local art shops and boutiques. You like Sanur? Now pick the right hotel! Should I book my Hotel in Tanjung Benoa? The haven for marine water sports in Bali; Tanjung Benoa is the exciting peninsula to go to if you’re in for some parasailing, jet-skiing, banana boat riding and many others. The hotels here are mostly of the boutique resort type and come as quite a mix. Dining spots are abundant along its main Jalan Pratama road, while nightlife and partying is not quite the feature here. Several stores, boutiques and local art markets offer some great shopping. You like Tanjung Benoa? Now pick the right hotel! Should I book my Hotel in Candidasa? The main destination in East Bali, Candidasa offers a quiet coastal escape away from the crowds. Although it lacks sandy beaches, the vast blue sea panoramas with calm waves make up and serve as perfect backdrop. Numerous hotels dot the area, from the hills to the low-lying coastal areas, and come in a variety of accommodation features, from budget sea view bungalows to full-fledged five star resorts. Great dining spots abound, while bars and cafes offer a rather low-key nightlife scene. Candidasa is the great starting point to explore the exotic east, from major temples, ancient Balinese villages and the world-class dive sites of Amed and Tulamben. You like Candidasa? Now pick the right hotel! Should I book my Hotel in Denpasar? For a closer sense of connection to Balinese town life, Denpasar as Bali’s provincial capital offers visitors one of the most local and non-touristy experiences. 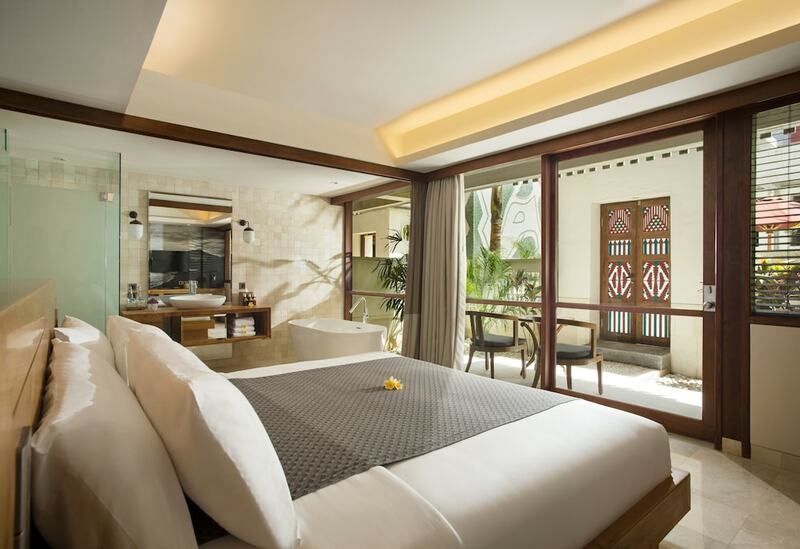 Accommodation options come as either new modern budget style city hotels that are fit for business travelers, or legendary hotels that carry historical significance and offer a sense of nostalgia, much like the characteristics of the classical hotels in Sanur. Denpasar is centrally located, convenient for exploring the other resort areas of southern Bali. You like Denpasar? Now pick the right hotel! Should I book my Hotel in Kerobokan? This small resort area in the North Kuta district is roughly sandwiched between Seminyak and Canggu. Most of the hotels you’ll find here offer secluded stays, some in slightly urban settings, while villa resorts closer to the coastline are truly laidback and perfectly suit honeymooners and couples, or groups travelling together. Kerobokan’s own coastline spans only 2.6km with a few beachfront hotels to choose from, overlooking its exotic black sand, surf and sunsets. You like Kerobokan? Now pick the right hotel!